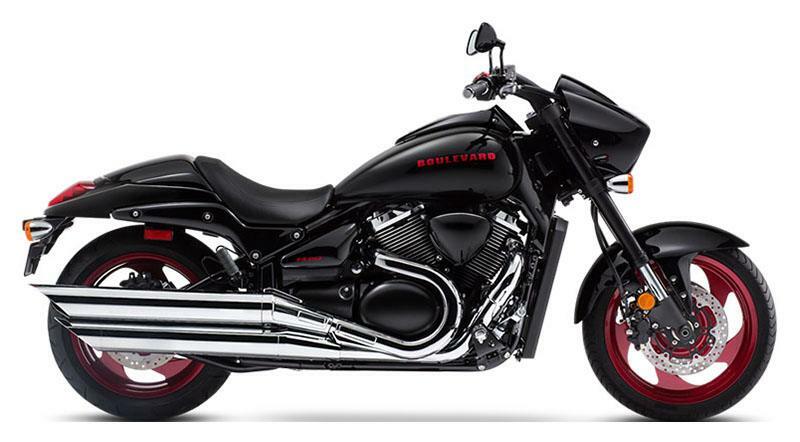 The Suzuki Boulevard M90 is a muscle cruiser with a sleek yet powerful styling that includes slash-cut mufflers, a hard-tail look, and drag-style bars. The distinctively shaped headlight nacelle presents a look that’s uniquely Suzuki. Whether you ride in town or lay down tracks out in the country, the M90 offers responsive handling and an exceptionally comfortable ride, thanks to its inverted forks, smooth, single-shock rear suspension, and ideally designed saddle. 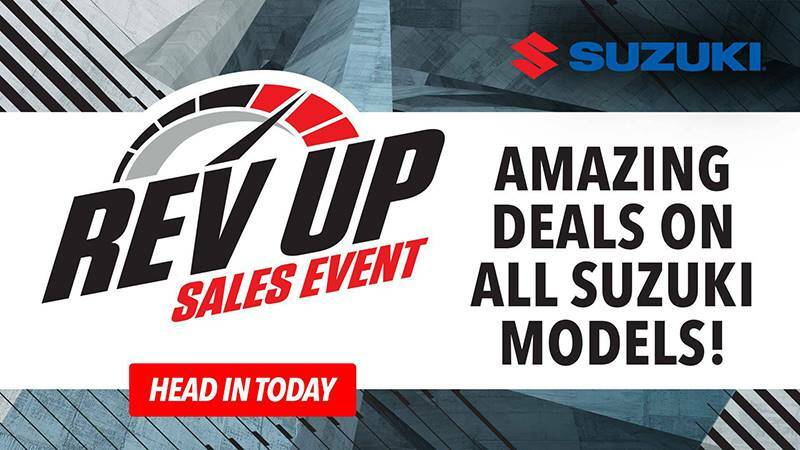 Its 90 cubic inch, V-twin engine with precise Suzuki fuel injection punches out tremendous torque and exhilarating acceleration from idle to redline. Suzuki performance-cruiser styling is sleek and flowing throughout from the distinctive headlight nacelle to the tapered tail section. The coil-over 46mm rear shock is hidden underneath the bodywork, so the ride is smooth and controlled. The large diameter, blacked out inverted forks feature 43mm inner tubes with 5.1 inches of wheel travel to soak up road imperfections and handle the powerful front brakes. Cast aluminum 18-inch front and 17-inch rear wheels, with a seamless black finish. Wide 120/70 ZR18 front and ultra-wide 200/50 ZR17 rear Bridgestone radial tires were specifically designed for M90. The long, stretched fuel tank holds a full 4.8 gallons of fuel. Wide, long, well-padded seat interfaces with the comfortable passenger seat that can be easily replaced with an optional tail section cover for solo rides. Multi–reflector headlight with a 60/55-watt halogen high/low-beam bulb. LED tail light with fisheye fresnel-cut smoked red lens. Bullet-shaped turn signals with unique vertical lens cuts. Potent 1462cc, long-stroke, liquid-cooled, 4-valves-per-cylinder, V-twin engine is built to deliver massive torque while providing good fuel economy. Large flywheels help smooth out low rpm power pulses, as does a spring-loaded primary drive damper bolted to the end of the crankshaft. A spring-loaded scissor-type split primary drive gear mounted on the crankshaft also reduces mechanical noise. Each aluminum alloy cylinder is plated with SCEM (Suzuki Composite Electrochemical Material) nickel-phosphorus-silicon carbide coating, which reduces friction and increases heat transfer, durability and ring sealing. Chromed dual exhaust with equal-length head pipes for excellent power delivery is mounted on the right side of the engine and provide a deep, rumbling exhaust note. Power is delivered through a wide ratio five-speed transmission and a shock-reducing damper, through a clean running, reliable drive shaft to the rear wheel. Two new bold looks for the 2019 Boulevard M90 – a two-tone Metallic Thunder Gray/Glass Sparkle Black paint scheme or a solid Glass Sparkle Black treatment that is set off by bright red wheels, matching the bike’s graphics. 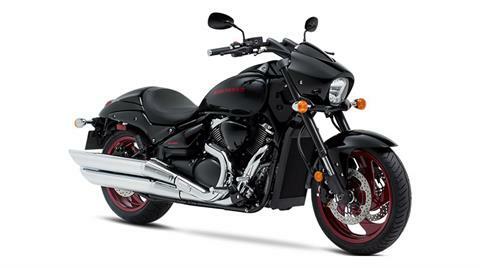 Both high-quality color treatments visually announce that this is a serious muscle cruiser and true to Suzuki’s performance heritage. It’s not just paint that’s impressive as the M90’s headlight nacelle, short risers, and drag-style handlebar form a distinctive Suzuki style that telegraphs the M90’s performance intentions. The bodywork is sleek and purposeful from nose to tail and looks even sleeker when the optional tail cowl is on in place of the passenger seat. The 90 cubic inch (1462cc), 54-degree, V-twin engine thunders through the slash-cut dual mufflers as it puts power through the shaft drive and down into the 200mm wide rear tire. Front and rear disc brakes for sure stopping performance, a large-diameter inverted fork, and the 200mm wide rear tire mounted in a sturdy swingarm that is controlled by a hidden rear shock – all give the bike a tough, aggressive stance yet deliver a smooth, controlled ride.